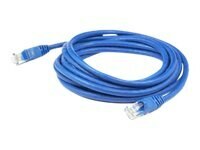 This is a 12ft RJ-45 (male) to RJ-45 (male) blue snagless shielded twisted pair PVC copper patch cable. The Cat6A cable is designed to support the high speed of EoC (Ethernet over Copper) over the full 100 meters. Cat6A cable standards provide a performance of up to 500MHz and is suitable for 100Base-TX, 1000Base-T and 10GBase-T. This PVC jacketed cable is best suited for LANs or SANs, and is recommended for connection between fiber patch panels, hubs, switches, media converters and routers. A shielded twisted pair patch cable offer both a higher bandwith and a more durable cablestrength than an unsheilded twisted pair cable. Our patch cables are 100% compliant for all of your networking needs. Our products are guaranteed by federal law to not affect or void OEM warranties.